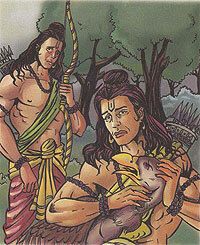 As Rama discovered the deceit of Mareecha, he grew anxious about Sita and Laxmana. Running through the dense forest, he called out their names. After some time, he saw Laxmana, and told him about Mareecha's deceit. How, by imitating Rama's voice, he had got Laxmana to come out, leaving Sita behind. Anxious that something terrible might have happened to Sita, the brothers rushed home. On reaching they found the door ajar and the fruits scattered. Sita was nowwhere in sight. They began a frantic search through the forests. Suddenly, they chanced upon the injured Jatayu. Writhing in pain, the bird just managed to tell them about Sita's abduction and pointed to the direction in which Ravana had gone. With folded wings, he bid goodbye and breathed his last.